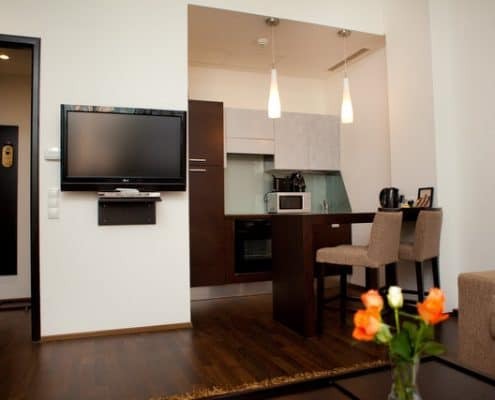 Our elegant apartment hotel myplace Riverside contains 35 modern, luxurious and fully furnished Serviced Apartments in the green heart of Vienna. Enjoy temporary living in an ideal location – only 2 subway stops away from the city center (U1/U4 Schwedenplatz). 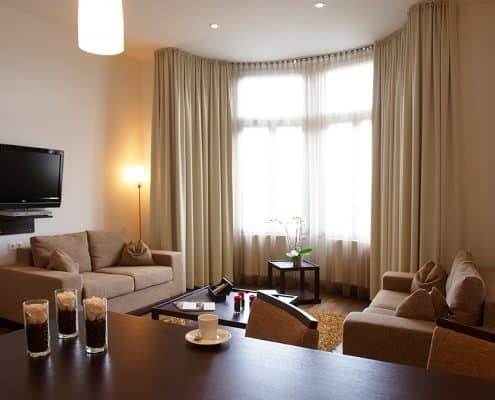 From most of our Junior Suites and Executive Apartments you will enjoy a fantastic view over Vienna and the Danube River. Behind our property you will find the famous Servitenviertel. The Servitenviertel is one of the most attractive and beautiful residential areas in Vienna. Along the Servitenstreet, parts of the Berg- and Porzellan- , and also the Schlickstreet you will find exclusive shops with a great assortment of goods. There is also a good selection of bakerys, coffee shops and restaurants. 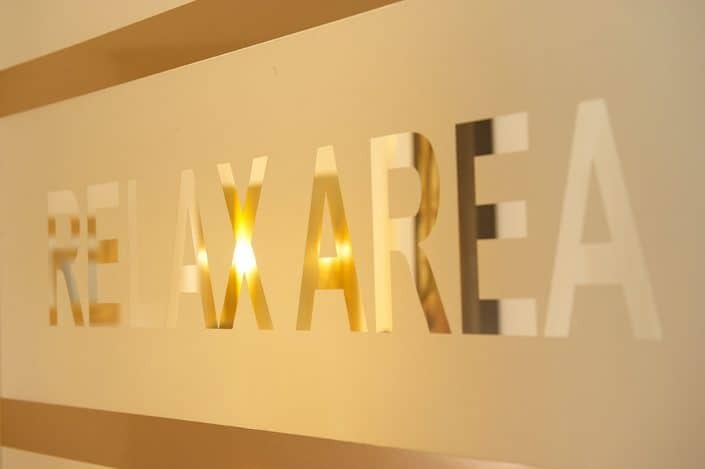 Whether for 1 week, for 1 month or for the whole year – by yourself or with your family – on business or pleasure – or even for medical reasons, our serviced apartments in the 9th district of Vienna offer everything you may require to make you feel comfortable and relaxed. 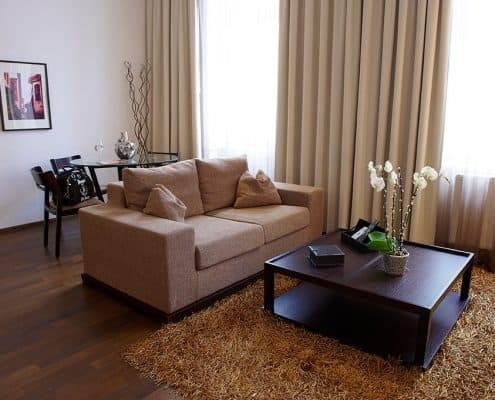 Spacious and fully furnished residences (37m² to 105 m²) with up to 3 bedrooms. A modern fitness lounge with sauna and relaxing room, a business corner and a skyline terrace with a great view over the city of Vienna complete your comfortable stay at myplace, your home away from home. myplace Riverside with its excellent location and spacious rooms in combination with the services of a hotel offers the perfect alternative to a hotel. Central and next to the Danube River canal – opposite the U4 subway station Rossauer Lände – myplace Riverside provides perfect access to the Viennese public transportation as well as bike paths. Within 30 minutes you are at the Viennese Airport! With pleasure we will arrange an airport pick up for you. Pending on the traffic the journey takes between 20 to 30 minutes. There is a large taxi stand at the airport. The costs are between 35- 45 Euros. (about 20-30 minutes, depending on the traffic). There is a bus leaving from the airport going to the “Morzinplatz”. 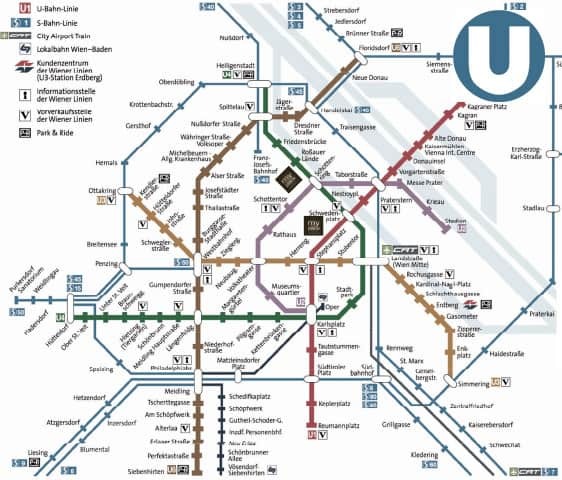 From there you need to take the underground U4 direction “Heiligenstadt” and exit at “Rossauer Lände”. Our hotel is located just across the road from the underground station on Rossauer Lände 23. (around 50 minutes, depending on the traffic). You can also take the train called CAT (City-airport-train) It leaves at the airport and stops at “Landstraße, Wien Mitte”. From there you can take the underground U4 direction “Heiligenstadt” and exit at “Rossauerlände”. Our hotel is located just across the road from the underground station. On Rossauerlände 23. (around 30 minutes) The CAT costs 11 Euros per person and leaves very half an hour (06 and 36 minutes past). The train called S-Bahn also leaves at the airport and stops at “Landstraße, Wien Mitte”. From there you can take the underground U4 direction “Heiligenstadt” and exit at “Rossauerlände”. Our hotel is located just across the road from the underground station. On Rossauerlände 23. (around 40 minutes) The train costs 2-3 Euros per person, but is not as comfortable as the CAT. 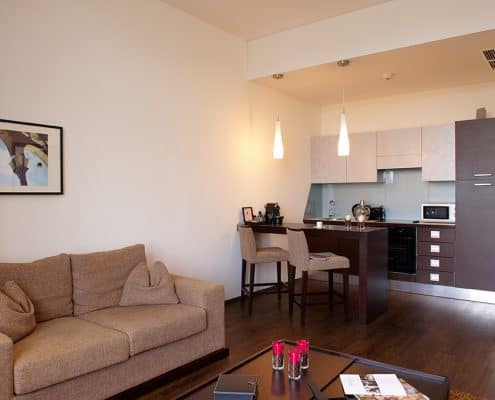 The 5 Standard Studios offer exceptional comfort which is completed by its warm gold and brown tones. The marble-tiled bath room as well as the luxurious bed with finest down beddings is ideal for a weekend for 2. 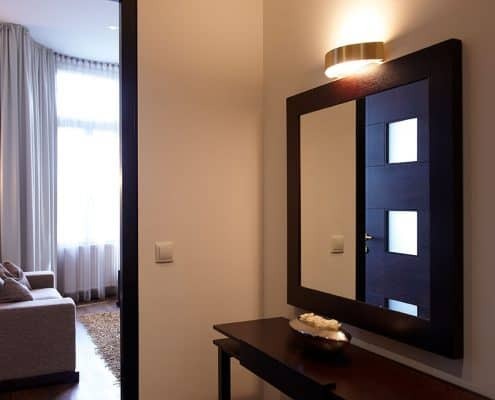 Living in style is the mantra of each one of the 7 Deluxe Studios, which offer a great view to the Danube Canal on the 1st floor and promise rest and peace on the upper floors where the rooms are facing the court yard. With the fully equipped kitchen and the Nespressomachines in every room of the hotel it feels just like home right from the beginning. Due to the separated living and bed room it is also suitable for small business meetings. 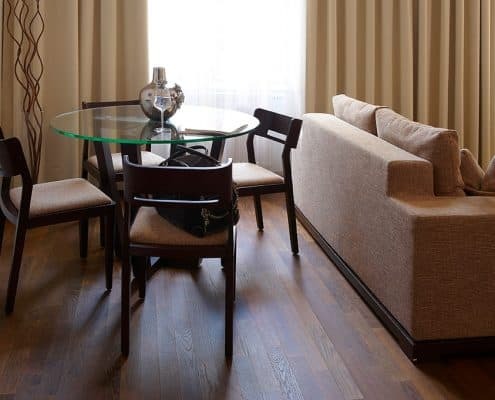 The 10 Junior Suites furnished with custom designer pieces offers the purest in luxury – as expected of a pleasant stay. Our Concierges offer high class individual service, taking care of all your wishes and requests – making your stay as stress-free one. The Junior Suites blooming in sunshine offer a view to Danube canal and Rossauer Lände. 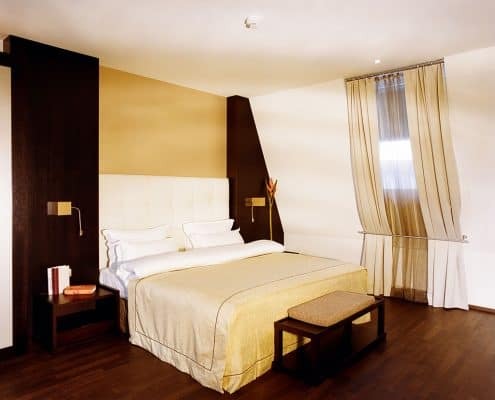 Eight Executive Suites, from which five are facing towards the inner court, feature the best beds, linen, pillows and pure luxury all around for the well-being and relaxation of the guests. Sleeping- and living area are of course separated in these spacious 65 m2 Suites and offer an ideal place for business travelers who often have clients or co-workers as guests or for small meetings and would like to be able to keep their sleeping area and bath as a private retreat from work. The three myplace Suites are the biggest suites in the myplace Riverside, with a total size of 80 m2. Two elegantly designed sleeping areas, which are separated from each other and the living room, invite to relax. 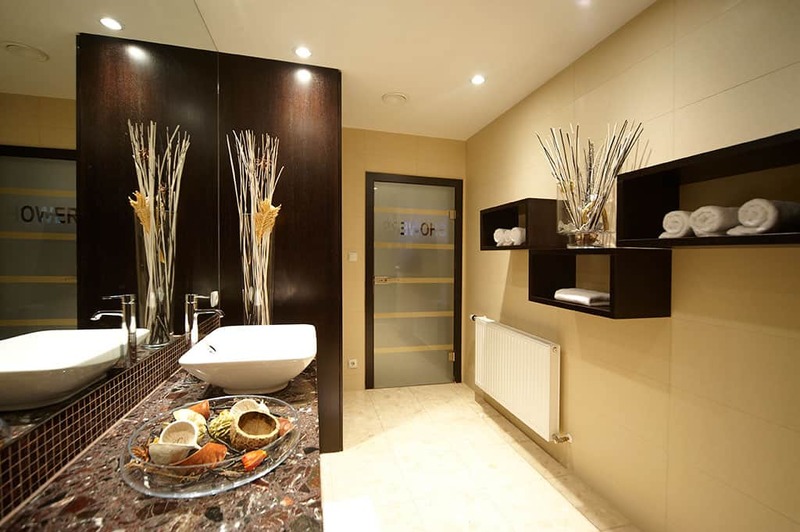 The two bathrooms, which are ensuite to the bedroom, offer pure relaxation with a rain shower in one and a bath tub in the other bathroom. 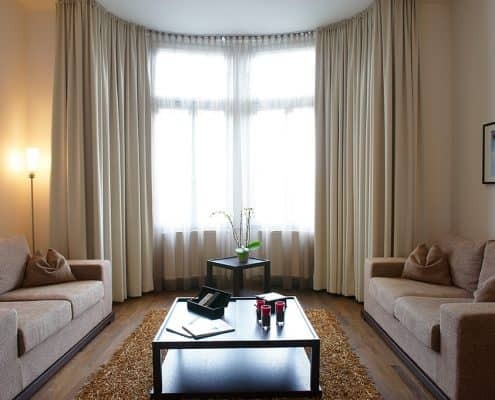 These carefully planned suites are brightened up by daylight thanks to the wide windows which are facing towards the Danube Canal and provide a marvelous view to nature while you are only a few minutes from the city center. 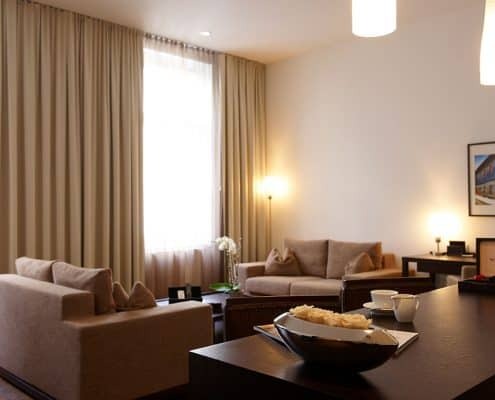 Our unique Penthouse Suite offers 105 square meters of open, elegant space, including a a fully equipped kitchenette and two separate bedrooms. 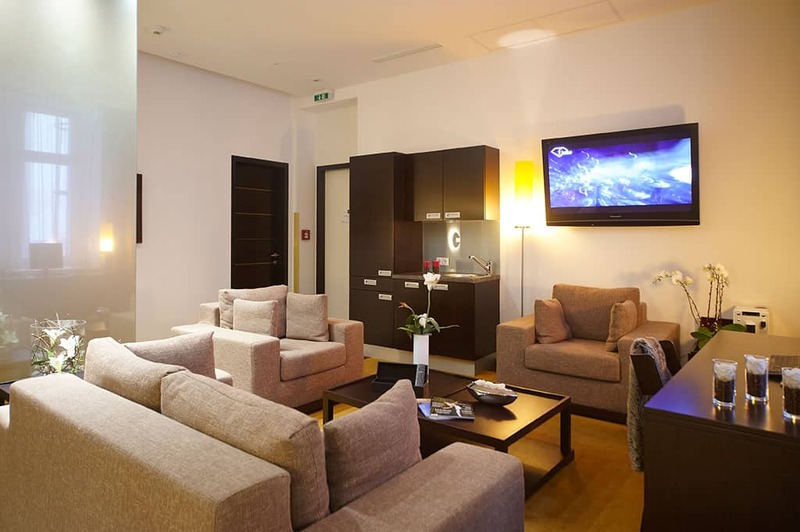 The stylishly furnished living areas provide the highest level of comfort for even the most demanding guests.